The following annual reports were all the award winners in their respective budget categories. The full list of award winners can be viewed here. This annual report features the brand’s blue as the anchor colour, with complementary alternate colours throughout. I suspect all of these colours come right from the brand manual, given how well they complement the primary blue. The report is incredibly tastefully done, with a single font used throughout (in its normal and heavy variants), and photos colourized to fit the section’s theme. A very elegant, well-designed report. Created as a website (which you should go view), this annual report is polished and extremely well designed. Built around the theme of campaign buttons, the report features the usual event highlights and statistics, but also profiles a number of library staff and university instructors using brief interviews and video. The profile sections feature parallax scrolling, which isn’t overused here. Really impressive. 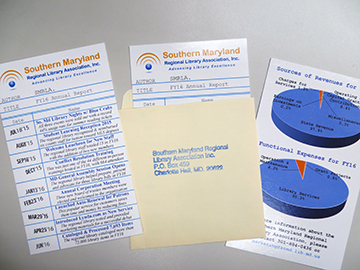 CCPL’s report focuses on a photo-dense story of the events the libraries hosted over the year, and highlighting a few key statistics and updates on the branches. The report wisely uses the two primary brand colours, providing cohesion to the document. I think the design would have been stronger if they used the flat version of the colour boxes throughout instead of the gradient versions. A fairly simple design, this report is executed professionally. It uses a simple colour palette, based on the brand colours, and includes a pleasant infographic (though is that 1 presidential visits or 10?). I think the photos could have been enlarged, and in some cases, brightened up. A solid effort. A traditional university annual report executed competently. It’s not flashy, but remains colourful and has a good mix of text and images. One simple way this report could have been made more exciting is with different font selection – the two chosen are fairly plain. On the other hand, I also recognize that font choices in universities are often regulated by the brand manual. Another thing to watch out for during layout is whitespace – images and text need fairly uniform space around them to look polished. Unfortunately, the electronic version suffers from some blurry photos and images that don’t scale well as a PDF. Kitsap Library presents something different here. Not an annual report, and not exactly a strategic plan either. Rather, it’s a report on a process the library undertook to understand the community it serves. The text describes demographic and economic details about the region the library serves, then goes on to describe key themes that conversations with various stakeholders produced: Connection, Engagement, and Sustainability. The library plans on using this to adjust its service models and align itself better with community needs. It’s all presented in an easy to read and visually appealing manner. Another really nicely designed document. One clever design touch is how the report uses a circle motif throughout for images and quote call-outs, and these echo the circular shape of the logo. Good use of colours: bright and engaging. One recommendation would be to not use a different font in the quote circles in the table of contents and at the end; the font chosen seems out of place with the rest of the document. 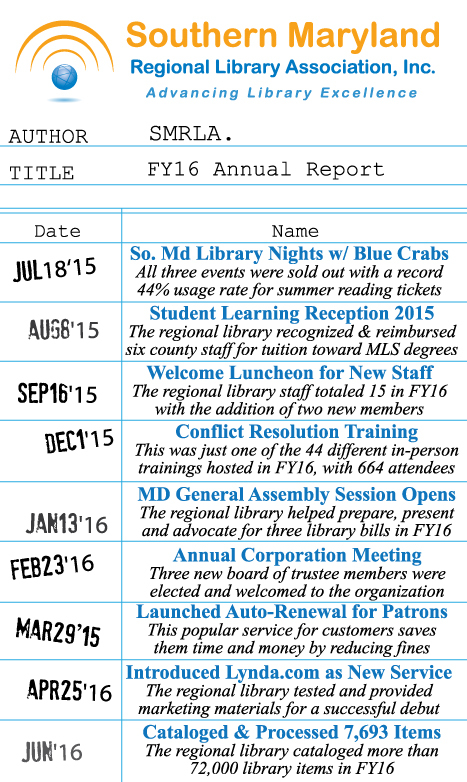 SMRLA went with a clever and compact Annual Report. Eschewing the typical multi-page photos and stories approach, their FY16 report is a double-sided sheet, designed like the old due-date cards, amusingly tucked into a big pocket. The front side lists key events and highlights with a very brief description, and the back includes some revenue and expense data in pie chart form. A fun twist on the standard format. Source: Not available online. Provided to Ad/Lib courtesy SMRLA. This is a bold, colourful report that really gives the impression of an engaged public library. Good mix of text and images, usually at least one photo per block of text. Disclaimer: The author (Andrew Colgoni) was one of 15 virtual judges for the 2017 PR Xchange Awards. This post and the commentary in it in no way reflects the opinions of the organizers or judges of the PRXchange Awards, and should not be construed as anything other than the author’s opinions.